This is part two of a four part series of “Traffic Signal Trivia”, dealing with some history and interesting facts concerning traffic signals. Part 1 covered vehicle signals in general, but left turns are a whole story in themselves, so here we continue. Note how there’s no warning, the “clearance interval” in traffic signal speak, that the turn phase is going to end, Later came phases designed to let a significant amount of traffic through, not just a few stuck cars. Also there were longer delays after the left turn phase ended before releasing oncoming traffic, but there was initially no indication for this. This “blind clearance” has been banned for many years but is still present in some older installations in other parts of the country. (This absolutely freaked me out the first time I encountered it, in Keokuk, IA). With the introduction of protected left turns, it took a while for this indication to be standardized. Some very early indications were white balls, rather than arrows. The indications were originally 8”, but soon grew to the 12” standard. Before the standard pattern came about, there was an alternative style (called the “Chinese Arrow” in collector / enthusiast slang) that had notable curves to the strokes, and another style with the arrow heads filled in. There was an arrow that was neon and even a white arrow has turned up, no doubt related to early white ball indications. Early left turn indication with a white ball in the middle section. Also of note was the “Arroway”, which was a panel that replaced the green indication. There was a 8″ green ball in the center and red bars and green arrows extending outward would light up indicating prohibited and protected turns. Later, with left turn lanes becoming more common and roads getting wider, left turns indications started being handled by a dedicated head. The yellow and red were standard 8” balls. Uniquely, California used visors on the red and yellow sections so through lanes would not see them. Red and yellow arrows came much later, in the 1970s, and red balls in left turn displays were still permitted until the most recent standards update. At one time red arrows were under consideration for being banned due to drivers not understanding them, but this is no longer a problem, drivers have since gotten used to them. Classical California left turn arrangement. Permitted operation is simply the default, where you have a single green light for all traffic, and left turning traffic has to yield to oncoming traffic. Protected is where you have the three left turn arrows and traffic is not allowed to turn when oncoming traffic has the green. The tradeoffs are efficiency vs safety. With protected only you remove 4 conflicts from the intersection, but dedicated arrows take up time in the cycle, and turning traffic has to wait even if there’s obviously no-one coming. A hybrid approach is protected/permitted, where both modes operate during the same cycle. This is a split the difference approach between efficiency and safety. Left turning drivers are less likely to take chances if they know they’ll get a protected movement eventually, and the permissive phase allows gaps in the oncoming traffic to be utilized. Lag lefts have the advantage in that drivers have less of a tendency to continue going through as the arrow turns yellow and red. I’m sure everyone has witnessed it where left turning cars keep going through until oncoming traffic notices they have a green and start edging forward. Secondly, the overall left turn phase can be shorter, as more turning traffic has an importunity to find gaps before the phase begins. Finally, pedestrians have the tendency to step into the street as soon as they see a red on a side street, which would put them in conflict with left turning cars. (I see this all the time at Calhoun parkway and William Berry Parkway; this would be a good location to modify to a lag left just because of pedestrian behavior). Sometimes traffic one direction will have both a through and protected left turn simultaneously, then it’s the other sides turn. The left tun traffic signal heads will be four lights, as in lag lefts the arrow always ends at the same time as the ball so a yellow arrow isn’t needed. This usually isn’t particularly efficient but is used where there’s a high volume of turning traffic relative to through (like a pair of shopping mall exits at a wide suburban road), or there simply isn’t room for adequate left turn lanes and it was determined a protected phase was necessary. In this setup it’s really easy for lanes to be used for both through and turning traffic as cars will never wait to turn blocking through traffic. Split phase display, can also be used for lag protected / permissive as neither require yellow arrows. Over time permissive turns became an increasing safety issue, as traffic volumes in general grew, and drivers becoming used to protected turns didn’t realize they had to yield on green ball. (Yes, this is a real issue, a permissive phase had to be yanked from a traffic signal in Stewartville because too many left turning drivers were not yielding on green) Another issue is that and lead/lag protective/permissive phasing (the most efficient way to operate coordinated intersections) creates an extremely dangerous situation called the “Yellow Trap”. Various local solutions were tried, including “Dallas Phasing”, (in Texas), flashing red arrows (in Delaware), flashing red balls- (in Michigan- where they were treated like a yield in practice, and Maryland), and flashing yellow balls (Washington state). So it was obvious a national solution was needed. This led to the development of our new friend, the flashing yellow arrow. The next post in the series will deal with the flashing yellow arrow and the various issues with permissive phasing. Thanks for another one of these great posts. Question: are agencies ever required to proactively replace old signals? Or do they just have to meet the modern standard when they replace a signal for some other reason? In particular, I note that Minneapolis has a number of lights that do not have yellow arrow, that are not split-phase. One example is EB 31st St turning left onto NB 1st Ave S. EB traffic gets a green left arrow at the beginning of the cycle, which simply vanishes right before WB traffic gets a green. A similar situation (although not as problematic) exists on Portland at Diamond Lake Rd, which has a protected right that simply ends. I also get a kick out of the old-school (if tedious) fully protected lefts on Lyndale in Bloomington and Richfield. 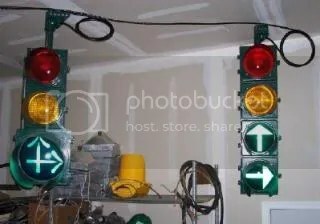 If I recall right, they have a green arrow, but the yellow and red signals are simply circular, and then there’s a sign next to it to demarcate “left turn signal”. In Bloomington, I believe it’s at 84th, 86th, and 90th, and in Richfield, at 65th. On the trade-off between efficiency and safety, I think my #1 least favorite fully protected left in the general South Minneapolis area is at E 66th St and TH 77 Cedar Ave. I can’t find volumes for Longfellow Ave, but my impression is that at least 90% of 66th St traffic that far east turns onto Cedar. Yet EB 66th only gets a protected left at the beginning of the cycle, followed by a firm red arrow for non-existent traffic coming WB/NB from Longfellow. EB 66th will only see another green arrow after a new cycle starts. I don’t know of any requirement to update existing signal equipment. The Mn/DOT pedestrian upgrades going on are a result of a ADA related legal settlement. Usually a new requirement specifies that old standards may remain “for the remainder of their useful service life”. The one possible exception was requiring the yellow trap be eliminated or warned of with an “oncoming traffic may have extended green” sign in 2003, with a “grace period” until 2008. 1961: The left turn indication must be a green arrow, and a clearance period after a left turn movement is required. 2009: Flashing yellow arrows are introduced and green and red balls for left turn lanes are banned. Lyndale is interesting, in it was one of the first switches from “4 lane death roads” to “stroads”, to use house terminology. It was rebuilt probably the very late 1960s or early 1970s, before red and yellow arrows were introduced, or at least were commonplace. In addition to the sign they used 3M signals to make it hard to see the left turn signals from the through lanes. Some of these have been replaced with standards setups in subsequent projects. 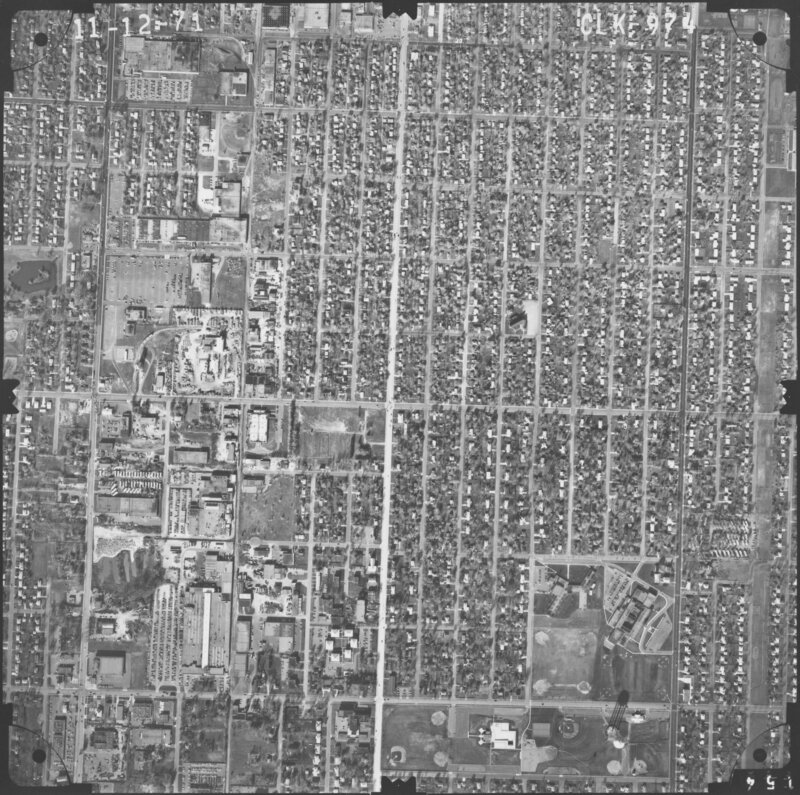 Lyndale 4-to-5 change must be from the mid-70s, as this picture in 1971 still shows Lyndale as an undivided 4-lane. Of course, Bloomington’s stroadgenuity is a science that’s never quite finished. Except for the very inconsistent sidewalks on S Lyndale, I don’t think it’s a terrible street for bikes or pedestrians. However, the newest section north of 82nd is an absolute nightmare, with full free rights (not even yield-controlled) and auxiliary lanes to 494 and American. Interesting article, thanks for the info and the history! I’ve been arguing for more split phases locally, not because they are always more efficient but because they have safety benefits. Since all straight and turn movements are accommodated for a single direction of traffic all at once, this means a left turn lane is not needed which in turn means a bike lane can be striped all the way to the intersection instead of being dropped to accommodate the left turn lane as commonly happens. On busy streets that are too narrow for a left turn lane this also keeps traffic from backing up behind a left turner (or swerving into a bike lane illegally to get around a left turner on the right). Do you know if split phases are commonly used for this purpose in specific cities around the country, and have their been any studies done on the potential safety benefits vs the impacts on motor vehicle traffic? “There” not “their” (spell check fail). Robert, the answers are “I don’t know” and I don’t know”. I’m an enthusiast / collector, not a professional, so I haven’t kept track of all the studies and practices. In general it seems big cities are always more reluctant to change, so you see a lot of older equipment and fewer protected only movements in general. Sean, I’d agree with you. Despite it being everything urbanists seem to hate, I did quite a bit of walking and bicycling along the south half of Lyndale before getting a car, and never really had a problem with any of it (my main annoyance was having to “in theory” stop and wait at the two signalized driveways in two blocks on 98th.) I actually liked the free right turns, since it was not hard to find a gap to cross to the island, and then you had fewer lanes to cross and knew the cars stopped weren’t going to edge out and not see you when trying to turn right. It’s as a motorist I don’t like them in most cases, because just because an auxiliary lane starts doesn’t mean through or left turning traffic isn’t going to swerve into it, and you have to turn your head at a sharp angle to look, and slowing down or stopping to be cautious is apt to irritate drivers behind you. And really, most of Lyndale is excessively wide. Except for right at 98th and near I-494. motorized traffic would do just fine with 3 lanes (and maybe a conventional right turn lane at major intersections). I’d rather the extra space be used for cycletracks or multi-use trails. The plan is for me to try to write article a month alternating my take on highway projects and land use with more geeky historical and engineering type articles. I have one planned concerning my ideas for the Oxboro area, but there was a surprise project to add LED crosswalks and sidewalks at 96th, and winter came before I could get out and take pictures. Depends on the free right, but some of them require some pretty significant detours for the pedestrian. Along 84th St in the Normandale Lake area, you have to really wind around at frequent signalized/free right intersections to the point of it feeling very tedious. I also agree Bloomington’s inconsistent treatments — sometimes getting a free flow into an auxiliary lane, most of the time being yield-controlled — that makes it very confusing for drivers. Turning from EB 494 onto SB Lyndale, it seems the majority of cars stop and wait for a gap in traffic, even though they in fact have an exclusive auxiliary lane to American Blvd. Same thing for SB Lyndale to WB American, which has a long auxiliary lane. Drivers are so accustomed to yielding (to cars… unfortunately not always to pedestrians) that they tend to stop anyway. I agree, I’d like to see Lyndale down to 3 lanes, except north of 82nd and possibly approaching 98th. North of 82nd, I’d like to see the auxiliary lanes removed. That would allow tons of space for more great things, like consistent sidewalks, cycletracks, on-street parking (in business nodes that would benefit from it, like just south of 98th), and perhaps even boulevard trees (although boulevard trees are presently illegal in Bloomington without a special authorization from the city forester). Oh, and the RRFB beacon at 96th I believe is to facilitate access to the new VEAP/Hennepin County social services which is just west of Lyndale, especially to and from the bus stops. Rather “lipstick on a pig”, since I believe there is still no sidewalk to access this important public building, and Lyndale is still miserable to cross. But, it’s better than nothing.